Last weekend I found some time for some coding for fun and learning. I played around with the basics of the canvas API, a bit more of CSS and visual stuff then I usually do. 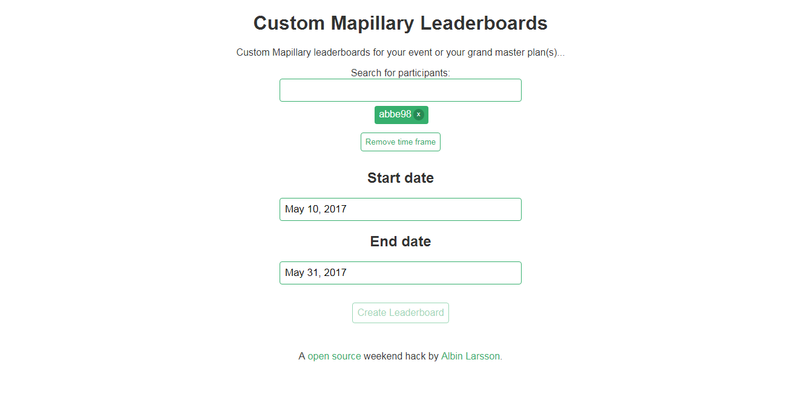 I ended up creating a site that allows Mapillary users to create their own custom leaderboards by just searching for participants and set a optional time frame. Leaderboards limited to countries/bounding boxes. Speaking of school once the holiday is here I plan to learn and play around a bit more then usual with quite new frontend technologies. I’m looking at learning things about Webassembly, Service/Web Workers, HTML context menu API, WebVR and a bunch of other things, give me tip if there is anything specific you think I should share and try.